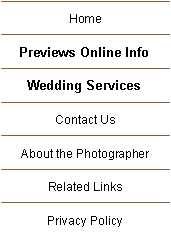 This wedding photography coverage that includes 2 1/2 hours of photography. Approximately 75 images will be presented in an album. This basic service is only available on Friday evenings, Sundays, or select Saturdays (non peak summer dates). Call for more information. Note: Most summertime Saturdays do not qualify for this coverage. · A coverage for second marriages or Friday night services.